Here’s what IRS.gov has to say about just one variation of a phone scam. – Call to demand immediate payment using a specific payment method such as a prepaid debit card, gift card or wire transfer. Generally, the IRS will first mail you a bill if you owe any taxes. law-enforcement groups to have you arrested for not paying. – Do not give out any information. Hang up immediately. – Search the web for telephone numbers scammers leave in your voicemail asking you to call back. Some of the phone numbers may be published online and linked to criminal activity. – Contact TIGTA to report the call. 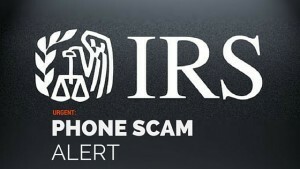 Use their “IRS Impersonation Scam Reporting” web page or call 800-366-4484.